Read on for this - and how you can win PRIZES! How would you describe your brand of horror? I’m afraid my books are more mystery/thriller a lot of the time. I think suspense is scarier than someone being disemboweled. Dreamwalker is a big departure. This one is full on horror, filled with voodoo curses, zombie killers and some graphic torture. I might not tell my mother about it. Where do you find inspiration for your work and what is your writing process? I didn’t have to go far for the inspiration for Dreamwalker. Pete Holm, the protagonist, has dreams with recurring storylines. So do I. I’ll be in an imagined place, but I’ve been there before, I can remember previous dreams in that location. I wondered what would happen if one of those places wasn’t somewhere in my imagination, but somewhere real. And that got the ball rolling. My writing process is strictly seat-of-the-pants. I have a few ideas, and then I start writing and see where they go, and where the characters lead me. At over halfway in, I need to reverse engineer an outline so I can keep track of where I’m going. What is the hardest lesson you have learned in relation to your writing? That a piece will never be finished. I can always reread something I’ve written and make changes to it that I think make it better. Even short stories, where I only have two thousand words to work with, you’d think that could be perfected. Nope. So I’ve had to learn to let it go before the deadline overruns me, and not look back. When you are not reading horror, what do you read? History, comic books and car magazines. But the comic books are Silver Age DC, and the car magazines discuss restoring classic muscle cars, so the whole lot might just qualify as history. Which books do you wish you had written? Anything by Stephen King, of course. I read Jonathan Janz’s Darkest Lullaby and kept stopping and saying “damn, that’s an excellent paragraph” so that one has to count as well. I know you are keen on history – as I am – so if you could live in another age (and maybe different place) when would it be (and, if relevant, where)? If I could get over the lack of actual medical care, and the minimal levels of sanitation and hygiene, a visit to ancient Rome at its height would be fascinating. The 1940’s would be cool as well. I’d be a lot less stressed about World War II knowing the good guys win, and it would be interesting to see if there really was a united sense of purpose in wartime, or it that was a myth created afterwards. Q Island, a story about a plague that turns Long Island, NY into a quarantine zone, comes out later in 2015. I’m working on another novel called The Portal, about the Devil trying to get his hands on an artifact that opens the door between Hell and Earth. I’m also in two new science fiction anthologies that benefit Doctors Without Borders; Still Out of Time – Six Stories of Time Travel and Centauri Station, a collection of space-oriented stories. Dreamwalker is the sixth novel that Russell James has published with Samhain Horror under legendary horror editor Don D’Auria! What if you lived in two worlds, and could die in either? Pete Holm can. 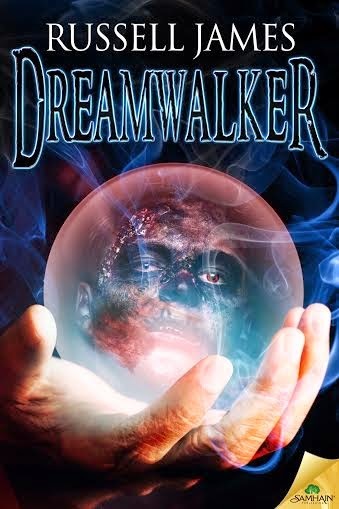 He is a dreamwalker, able to travel to the realm of dreams, including the devastated world of Twin Moon City, where an evil voodoo spirit holds living souls in terror with his army of the walking dead. In the waking world, drug lord Jean St. Croix knows only the power of the dreamwalker can stop him, so St. Croix vows Pete must die. Pete is the only hope to rescue the lost souls in Twin Moon City…unless St. Croix kills him first. Can anyone survive when two realities collide? 1 Open reviewer giveaway: Anyone who reviews Dreamwalker on Amazon and one other site like GoodReads, etc. and sends Erin Al-Mehairi, publicist, their links to hookofabook@hotmail.com will be entered to win a $20 Amazon gift card. This contest ends on Feb. 28, 2015. 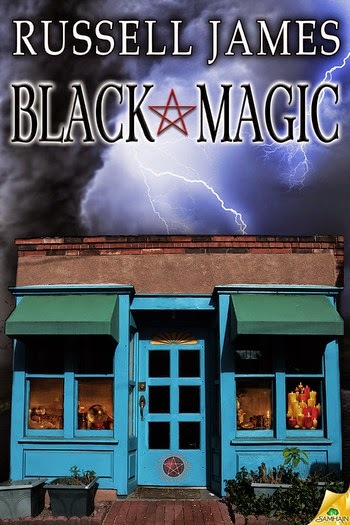 Rafflecoper giveaway for two copies of Russell’s previous books: Two winners will each win one of two books, Black Magic and Dark Inspiration. US only, no international shipping. Must use a valid email that you can be reached by. By entering the giveaway, you consent to allow Russell to have your email for very infrequent newsletter updates. Contest ends Feb. 28, 2015. Other contest questions can be referred to Erin Al-Mehairi, publicist, Hook of a Book Media at hookofabook@hotmail.com. After a tour flying helicopters with the U.S. Army, he now spins twisted tales best read in daylight. 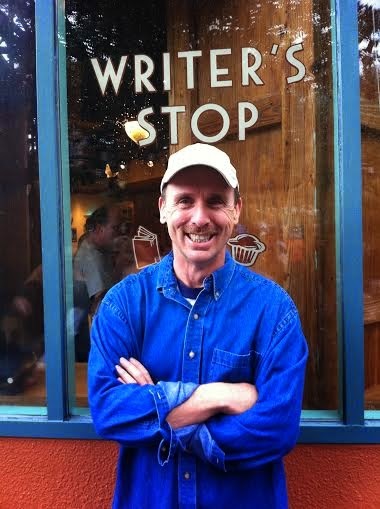 He has written the paranormal thrillers Dark Inspiration, Sacrifice, Black Magic, Dark Vengeance, and Dreamwalker. He has two horror short story collections, Tales from Beyond and Deeper into Darkness. His next novel, Q Island, releases in 2015. His wife reads what he writes, rolls her eyes, and says "There is something seriously wrong with you." 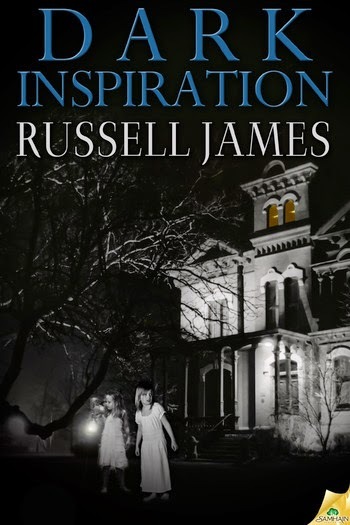 Visit his website at www.russellrjames.com and read some free short stories. He and his wife share their home in sunny Florida with two cats. To find out more about Russell R. James, please visit his Website or follow him on Facebook! Join him on Twitter. Also, feel free to drop him at a line at rrj@russellrjames.com. Hello Catherine. Hello Russell...just catching up with myself here finally...and getting the chance to say Hello, and I do like horror so will be checking out your books. Thanks Shehanne. I can personally vouch for Russell's books - my kind of horror! Scary and riveting.